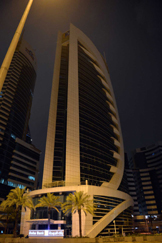 Affirming its commitment to supporting climate change action and raising awareness about energy conservation, Doha Bank switched off the lights in its corporate headquarters and select branches across Qatar Saturday evening as part of its participation in the 11th annual Earth Hour. A people’s movement organized annually by the World Wide Fund for Nature (WWF), Earth Hour is the world’s largest demonstration of support for action on climate change. To mark the event, every year people around the world turn off all non-essential lights for one hour from 8.30pm-9:30 pm local time. Commenting on the need for decisive action on climate change, Dr. R. Seetharaman, CEO of Doha Bank, said, “Climate Change is the greatest challenge facing humanity in the 21st century. Doha Bank is one of the very few institutions in the region that have an active “green” policy in all areas of their business, and the Bank’s corporate headquarters in West Bay is designed to save energy while maximizing ambient comfort. The Bank also maintains a well-defined Environmental Policy that encourages staff at all levels to “Reduce, Reuse & Recycle” to minimize resource utilization. As part of its efforts to encourage environmental awareness at the grassroots of society, Doha Bank organizes a number of annual initiatives such as the Al Dana Green Run, the largest community run in Qatar which this year saw participation from more than 6,000 people, and the ECO-Schools Programme which seeks to integrate sustainability into the operational framework of schools and encourage schools to become eco-friendly institutions by taking practical steps towards a greener path and by reducing their carbon footprint.